Last year, the Accounting CPE Network was pleased to introduce the ACPEN Tax Institute (Ati). Following the very successful development of the ACPEN Industry Institute (Aii), we felt that special attention should be paid to CPAs who practice in the tax arena, one of the most challenging and fluid areas of practice. Since it's creation, the goal of the ACPEN Tax Institute is to create a specialized line of programming that provides the most up-to-date information relating to tax code and practice. This unique line of CPE training is designed to serve tax professionals, brokers, attorneys and enrolled agents. The cornerstone of this institute is an eight-part series, Doing Business With the IRS. These courses provide practitioners with what they need to know to successfully represent clients in all matters related to the U.S. Internal Revenue Service. The CPE program is designed and led by Larry Jones, JD, of the Dallas, Texas firm of Townsend & Jones. In addition, each part of the series will have one or more experts who will address the topic of the course. ACPEN has also partnered with Federal Tax Workshops for production of numerous Ati courses. With a broad range of subject matters, such as individual and corporate tax, partnerships, S corporations, and ethics, Federal Tax Workshops has been dedicated to providing the most up-to-date information on tax and financial developments for forty years. 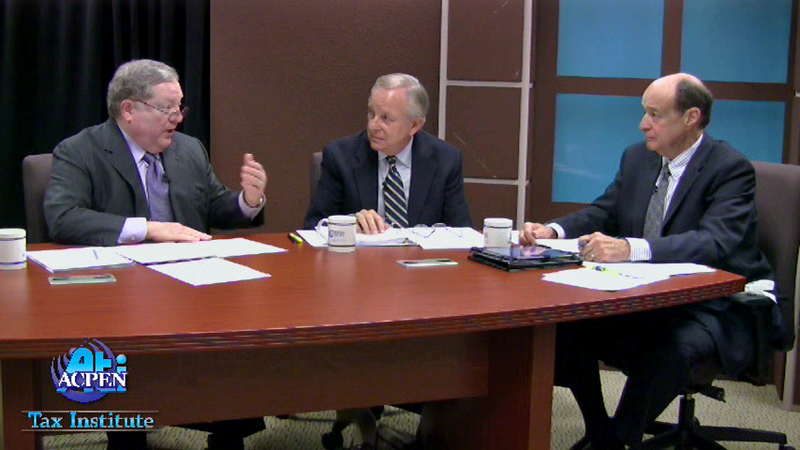 All ACPEN Tax Institute courses are available as video webinars for individuals. Additionally, arrangements can be made for live, group on-site CPE training. Any course, can be specially scheduled for on-site webcast training. If you wish to further customize your firm’s continuing education experience, we can assist in arranging for an Ati presenter to present directly to you and your colleagues. The ACPEN Tax Institute aims to assist you and your firm in offering the best tax information to you and your clients. A complete list of topics, date choices, and presenters can be found on the ACPEN Tax Institute page of the ACPEN catalog.